Totaling an estimated €64.9 billion in 2014, the U.S. is larger than the next four largest markets combined, according to Bain/Altagamma. The U.S. represents luxury brand’s greatest marketing opportunity because the number of Americans who can afford to pay luxury prices dwarfs that of any other country. The Federal Reserve Bulletin puts the total number of wealthy millionaire households at 12.2 million. While the rapidly growing ranks of the wealthy in emerging markets like China make the news, with estimates ranging from 1 million (Hunan) to 4 million (BCG) millionaires in China, the U.S. millionaire market greatly exceeds that found in China. And it’s not just the 12 million U.S. millionaires that are targets for luxury brands, but the top 20% high-income affluent consumer segment, of which there are 28 million or so. Within the top 20% there are 3.3 million Ultra-affluent households (incomes $250+ putting them at the top 2-3%) and the 24.3 million HENRYs (high-earners-not-rich-yet) that comprise the mass-affluent consumer segment. The wealthy and high-income Americans remain the best target market for luxury brands in the world. That is why Unity Marketing’s latest in-depth study, Luxury Report USA, is a much needed research tool for every luxury brand. It is a comprehensive look at seven-years of trends in the market for luxury goods and services. It includes both a pre- and post-recession look at the U.S. luxury market. Who has the disposable income to buy luxury? Where can brands find niches in the affluent market — ethnicities, genders, income levels, wealth – that have the money to spend on what you are selling? How do today’s affluent define luxury? What positioning works today for a new value-based customer? What are the luxury consumers buying today? What luxuries are hot, what not as measured by luxury consumer demand? How much do luxury consumers spend on different categories of goods and services? How can brands capture a greater share of the affluents’ spending within and across different luxury categories? Where are today’s luxury customers shopping? What are their favorite brands? How are their shopping habits and brand preferences changing and how can brands put themselves out in front to be there where the customers are now browsing for new goods and services? How can brands build connections to the best target customer by hitting the right notes in marketing and branding? The Luxury Report USA is an ideal research tool for luxury brand marketers that need to understand not just their core customers, but also the target customers that they haven’t yet met in their stores, online or on social media. It includes brand tracking, as well, to measure where a brand stacks up against the competition. The Luxury Report USA is a powerful desk reference for advertising agencies preparing a pitch to a new luxury client. It provides the research foundation that demonstrates the agency knows and understands who the luxury customer is and how to reach them. And it covers 21 luxury goods and services categories, so agencies are ready to pitch to a fashion brand today, a home furnishings client tomorrow, and next week to a prospective hospitality client. The Luxury Report USA is for retailers who are challenged by intense competition coming at them from all different directions. Nobody needs to tell retailers that they face a rapidly changing selling environment where the old tricks no longer work. Retailers need the kind of intense research-based look at the potential customers that walk by their door. The Luxury Report USA reveals how brands can attract them into their door, rather than walk on by. This report includes eye-opening statistics, plus case studies and advice that turn research findings into actionable marketing strategies and tactics. Unity Marketing has done the important research work in advance to deliver critical market intelligence about the high-powered customers luxury brands need. Success in the luxury market begins with understanding the needs and desires of the affluent customers. 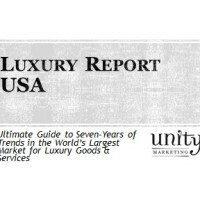 Get an edge on the competition with The Luxury Report USA by the luxury consumer experts at Unity Marketing. Pamela N. Danziger is an internationally recognized expert specializing in consumer insights for marketers targeting the affluent consumer segment. She is president of Unity Marketing, a boutique marketing consulting firm she founded in 1992. REI Nailed It with #OptOutside!